This is surely one of our most familiar commensal birds, all of their nest-sites being on man-made structures. Although some House Martins nest singly, most of them group into colonies, which may be obvious, with many nests all on one building, or more dispersed, perhaps covering several streets of houses. Some large colonies have been counted for many years, including at Winick Hospital, Warrington (now demolished) (maximum of 123 nests in 1992); Alderley Park (maximum of 73 nests in 1992); Styal Prison (maximum of 124 nests in 1997) and Toft Hall (maximum of 62 nests in 1999). The colonial birds apparently all join together in feeding flocks, pleasantly twittering, often high overhead, as they catch flying insects, especially flies and aphids. In this survey, 94% of the habitat codes submitted were in categories E or F – farmland and human sites – exactly the same as for Swallow. House Martins, however, are even more associated with human sites (78% of records compared to 67% for Swallow), and with more of an urban bias (30% of the F codes being urban or suburban, compared to 20% for Swallow). The farmland codes were spread across all categories of farming, but mostly the grassland types where flying insects are most likely to be found. This Atlas shows that House Martins are almost ubiquitous but apparently missing from the vicinity of Birkenhead, Runcorn, Chester and Northwich, and thinly distributed in the east of Cheshire. They have been lost from a number of tetrads since the First Atlas: the ‘change’ map shows 18 gains but 50 losses, widespread across the county with no discernible pattern. This suggests that the species has become less common than twenty years ago. Participants in the CAWOS House Martin survey report on fluctuations in the number of nests at their site, but unfortunately this tells nothing about the species’ population and just reflects the well-known propensity for individual colonies to grow or contract. To establish population changes really requires a thorough survey of all the House Martins in quite a large area. The BTO analysis of BBS results shows that the breeding population of Cheshire and Wirral in 2004-05 is estimated at 19,630 birds (7,540-31,710). This figure, an average of 19 pairs per tetrad with confirmed and probable breeding, amounts to 1.6% of the national population (Newson et al 2008), making the county much higher than ‘average’ for House Martin population. Although there is no regular national population monitoring, the BTO have taken a cautious approach and recently added House Martin to the amber list of species of conservation concern. Many other long-distance migrants are declining; almost nothing is known about the House Martins’ wintering areas in trans-Saharan Africa (Migration Atlas). 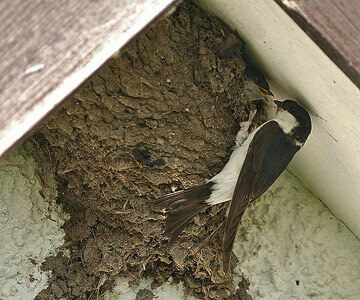 Whilst in Britain, they have no particular hazards to face during the breeding season, although some householders object to their nests and take action to deter the birds, ignoring the folklore that bad luck attends a house deserted by House Martins. Perhaps more of a concern is the use of modern building materials, for the birds cannot build their mud nests on plastic soffits and fascia boards.